Kari is a Female Personal Trainer offering In Home Personal Training in South Fort Myers Florida. Kari has 20+ years in the Health and Fitness Field. Kari’s passion for fitness started early in life, as she was an accomplished and an award winning gymnast through grade school and high school. She later found her passion in cheerleading, and continued her love for the sport through college and received her Bachelor of Science from Wingate University in North Carolina. Upon College Graduation, Kari began to use her knowledge and passion for fitness to help other people achieve optimal health. Over the course of her career, Kari has helped changed many lives through proper nutrition and scientific exercise program design. Kari is certified through the National Academy of Sports Medicine. She also holds several special population certifications, some including NASM Golf Specialist, Pre-natal, AFFA Group Training, NASM Nutrition Consultant, Senior Fitness, and NASM Corrective Exercise Specialist. She continues her education yearly and is currently studying to become Rock-Tape certified. Contact Kari Today for a FREE consultation. 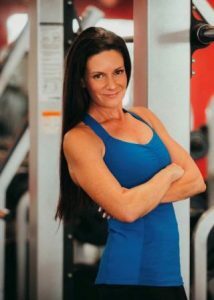 Learn more about In Home Personal Training in Fort Myers FL with Kari. Submit your name, e-mail, address, city and any comments/ questions you might have.